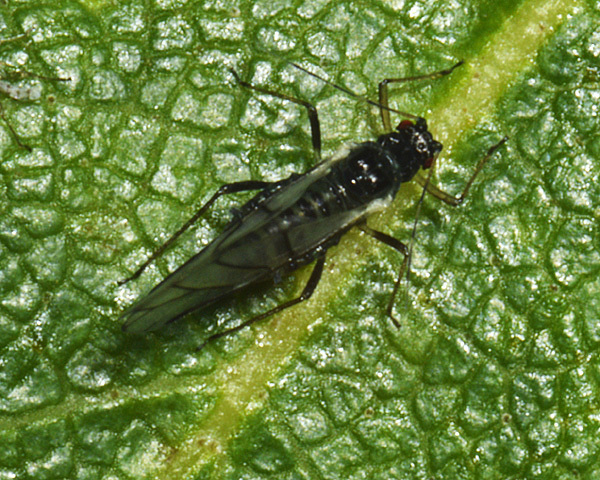 Callipterinella aphids are small to medium-sized, and the viviparae may be winged or wingless. They are very variable in colour from green to brown, yellow or reddish commonly with a brown vertex to the head and usually other dark dorsal bands or spots. The body is covered with long strong hairs and the antennae are shorter than the body. The cauda is constricted and knobbed, and the siphunculi are short and dark with rows of minute spinules. Winged forms have the wing venation strongly marked. Callipterinella is a genus of three species, all of which live on Birch (Betula) leaves or growing shoots. Colonies may be dispersed or aggregated. They have a sexual stage in their life cycle, but do not host alternate. Callipterinella are usually attended by ants. 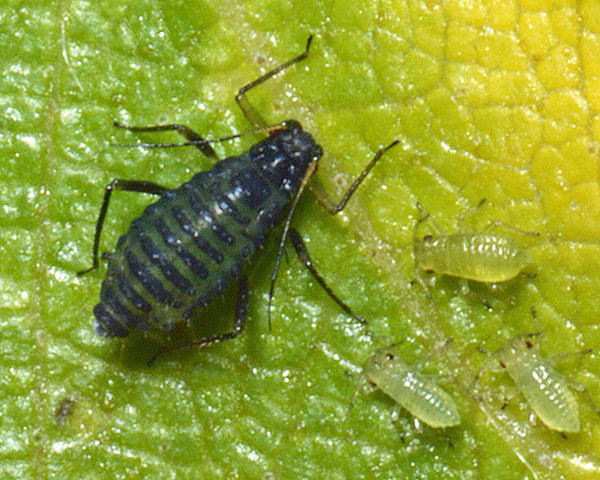 Alates (see second picture above) have dorsal markings less well developed. Immature Callipterinella calliptera are yellowish-green with rows of dark tubercles on the abdominal dorsum. Black banded birch aphids are found in ant-attended groups on the young shoots and under leaves of birch (Betula spp. ), sometimes inside leaves sewn up by lepidopterous larvae. Callipterinella calliptera is found on both silver birch (Betula pendula) and downy birch (Betula pubescens) in Europe, and on other birch species in east Asia. 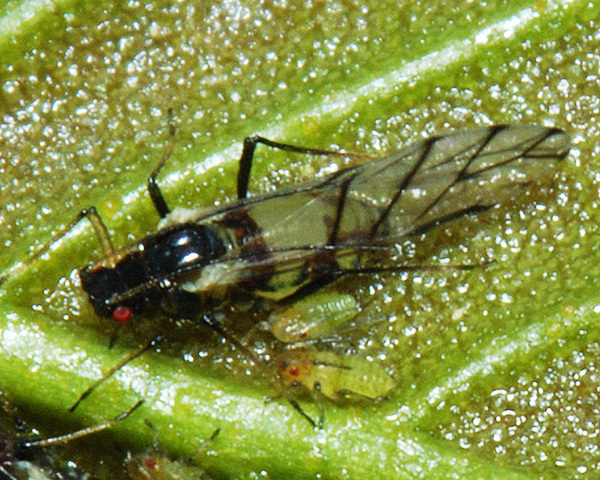 Oviparae and alate males occur in September-October. It occurs throughout Europe and across Asia, and has been introduced to North America. Callipterinella tuberculata apterae are usually yellowish with a brown head, a reddish-brown dorsal band over the front of the abdomen and a dark quadratic patch on abdominal tergites 4-6. However, the dark markings are very variable. The dorsum has dark, strong hairs and spinules on each segment. The antennae may have five or six segments. The antennal terminal process is 1.7-2.8 times longer than the base of the last antennal segment. The siphunculi are dusky with rows of small spinules. The cauda is very short with only a slight constriction. The body length of Callipterinella tuberculata apterae is 2.3-2.5 mm. Winged forms of Callipterinella tuberculata have reddish brown patches on the dorsum of the first abdominal segment and irregular small brown sclerites on posterior abdominal tergites, but no transverse bands. 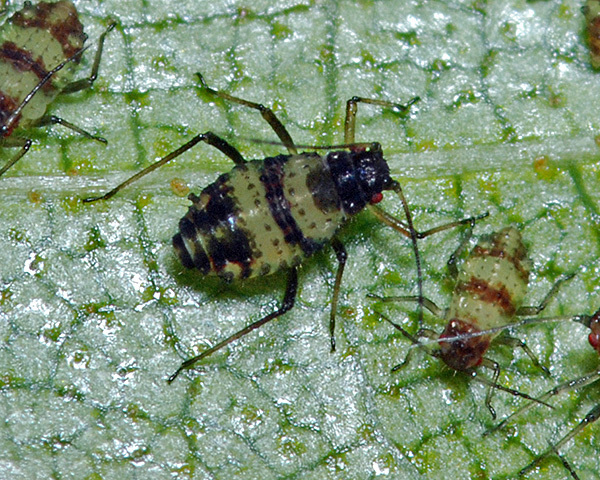 Red banded birch aphids are found in colonies on young growth and scattered on older leaves of silver birch (Betula pendula). In Europe they are restricted to this one species of birch, but in Siberia apterous Callipterinella with a dorsal quadrate patch similar to Callipterinella tuberculata have been found on several different Betula species. Apterous males and oviparae are found in September. This species is found across Europe and (probably) in East Siberia and China.